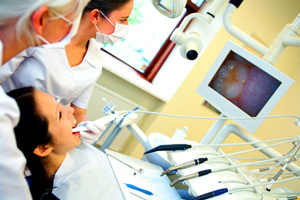 Anchorage Dental Care believes in providing our patients with the most comfortable dental experience possible. Because of this philosophy, we have invested in the most recent state-of-the-art technology to limit the amount of time you spend in our dental chair and to help educate you so you can make informed choices about your treatment. At Anchorage Dental Care, we welcome an opportunity to demonstrate our intra-oral camera and other state-of-the-art dental equipment. Give us a call to schedule a pre-appointment visit to learn more about our practice and the ways in which we can make your appointments safer, shorter and more productive.